Ms. Eccles is a partner in the law firm of Dunlap Fiore LLC. She has a Martindale-Hubbell rating of AV Preeminent Lawyer, was selected to the Rising Stars list in Government Contracts and Surety Law by Super Lawyers, and is licensed to practice law in Louisiana and Texas. Her practice involves the representation of prime contractors, subcontractors, service disabled veteran owned enterprises, sureties, insurance carriers, and commercial enterprises. Ms. Eccles also serves as special assistant attorney general and advises state agencies and municipalities as general counsel. Ms. Eccles guides contractors on regulatory compliance and licensing concerns, provides advice to government contractors on contract novation requirements, name change procedures, submission of certified claims on military construction projects, voluntary disclosure, resolution of False Claims Act allegations, and assists clients with drafting contract documents, resolving performance disputes, and making contract claims. Ms. Eccles also represents businesses and insurance companies in general litigation matters, preparing business formation and operation documents, and advises sureties on resolving performance and payment bond claims on government and private construction projects. 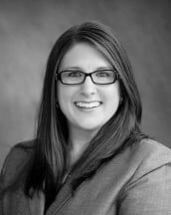 Prior to joining Dunlap Fiore LLC, Ms. Eccles was a tort litigation associate at an international law firm. Ms. Eccles litigated refinery construction defect matters, defended insurance carriers on casualty claims, and served as coverage counsel. Additionally, she provided leasing and property management advice as local counsel to a national real estate management firm. Selected to the 2014 - 2018 Louisiana Super Lawyers Rising Stars list.